Despite its illegal status, cocaine remains one of the staples of social drug use. The stimulating effect of the chemical has been glamorized in modern-day culture and continues to be lauded as a means to artificially keep the mind active. Yet, as anyone who has tried this high can tell, the side effects are far less delightful. They include memory loss, increase heart rate, insomnia, and almost instantaneous addiction. In the brain, cocaine leads to numerous changes. The most notable is an increase in dopamine, the source of the storied high. This spike is short-lived yet induces long-term physiological changes, particularly in the ventral tegmental area, or VTA. The neurons in this area quickly learn to expect that rush of dopamine. Unfortunately, only another hit of the drug will suffice without withdrawal. At the molecular level, the high of cocaine is due to a rise in activity of VTA neurons. This is known as synapse potentiation. This process is regulated by one particular molecule, known officially as the α-amino-3-hydroxy-5-methyl-4-isoxazolepropionic acid receptor but more commonly called AMPAR. When the drug is introduced, the levels of AMPAR increase leading to a surge in neuronal activity. But there’s a dark side to this type of potentiation. Normally, AMPAR contains a regulator, known as the glutamate receptor A2 or GluA2, to ensure it does not overreact to certain stimuli. However, in the presence of cocaine, this piece of the protein is absent, meaning the spike is uncontrolled. The resultant high is overwhelming and the low that follows once the dopamine is gone is unbearable. Figuring out how to deal with cocaine addiction at the molecular level requires a better understanding of how AMPAR can be better regulated. For a team of researchers at the University of British Columbia, led by Dr. Shernaz Bamji, this meant focusing on another molecule in the brain. It’s known as a cadherin adhesion molecule (shortened to cadherin), and as the name implies, it’s responsible for ensuring neurons are able to connect to one another and maintain proper synapse potentiation. The results of their examination, now available in the journal, Nature Neuroscience reveal the importance of these molecules in controlling the high and more importantly, avoiding the lows. The first step was to ensure cadherins were involved in cocaine stimulation. The team examined the brains of mice after exposure to cocaine and found the molecules were indeed playing a role in VTA as they were found in the synapses. Going even further into the cell, the team found the cadherins were grouping in the same areas as the AMPAR, suggesting they were somehow improving the potentiation and in effect, the high. This was reinforced by the realization these molecules left the region when the high was over. The latter finding offered a new potential theory regarding the development of addiction. Instead of AMPAR being the sole lynchpin of the process, cadherins play a vital role. When these molecules are present in the synapse, the high is maintained but when they leave the area, the lack of heightened activity leads to withdrawal. Proving this, however, required more than just a simple test. The team had to change the genetic nature of the mouse such that they could stabilize the cadherins in place even after the dopamine high was complete. When they did this, they saw a 48% decrease in cocaine’s effects on the brain. This suggested cadherins were indeed playing a role. As to what that role might be, the team looked at the individual molecules involved in the high. The result was unexpected and yet remarkable. For some reason, having those stable cadherins ensured AMPAR had the GluA2 regulator. This meant the synapse potentiation was controlled and the mouse simply could not experience that intense cocaine high. In essence, the team had figured out how to block the drug and the resultant addiction. This study reveals the fascinating mechanism by which cocaine disturbs normal brain processes and why people experience those dramatic highs and lows. The findings also suggest some individuals may be more susceptible or resistant to addiction as a result of changes in their genetic code. This may help to better employ treatment regimens to improve detoxification and identify those most at risk of returning to the habit. There is, however, a rather inconvenient message associated with these results. Because the effects of cocaine are depletive rather than additive, developing cadherin-based therapies to combat addiction are not an option. As such, if you ask Dr. Bamji how to ensure one does not suffer from those dopamine spikes and the resultant uncontrolled synaptic activity of AMPAR in the VTA, the only way is to avoid using the drug, period. Mills F, Globa AK, Liu S, Cowan CM, Mobasser M, Phillips AG, Borgland SL, Bamji SX. 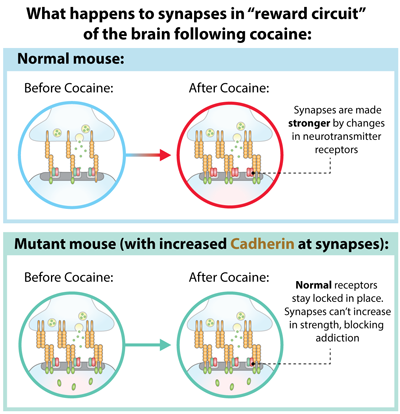 Cadherins mediate cocaine-induced synaptic plasticity and behavioral conditioning. Nat Neurosci. 2017 Feb 13.